Is it Thursday already?! This past week has been such a blur, but at the same time the longest week EVER. Baby Monkey has been sick since last Friday and is thankfully, FINALLY, on the mend. Days of rocking said fussy baby and nights of fitful sleep have left us both quite exhausted! Now, two more Monkeys are ill, so I felt the above embroidery hoop art is appropriate. Oh, and last week's washing machine drama! Let's just say that with some helpful YouTube videos (thanks, Appliance Parts Pros and partselect.com! ), some timely advice and lots of sweat, my lovely daughter and I replaced the outer tub gasket and eventually dislodged a pencil and a stick from the water pump. No more water flooding onto the floor! No expensive parts replaced! 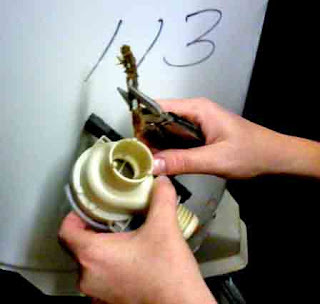 No costly repairman call! And now for our Thrifty Thursday post! ﻿Embroidery hoops! A very common, very inexpensive thrift store find. 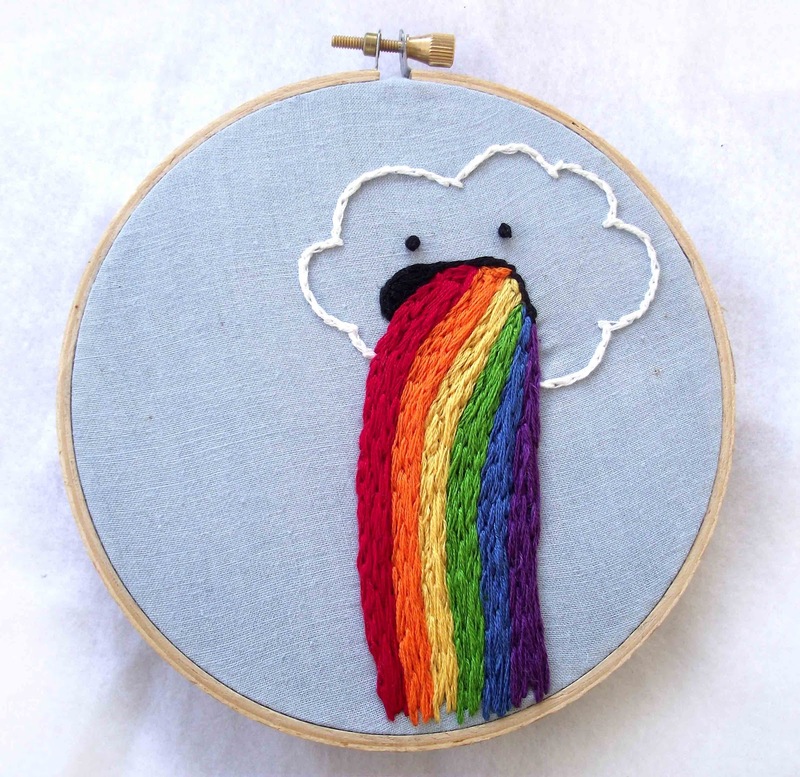 And right now, a pretty hot crafting and decorating item! I usually find them in bundles, and usually for about a buck. all sizes. some wood, a few plastic or metal. some old, some new. enormous hoops. probably less "embroidery," and more "quilting," but I still like them. While cruising around Pinterest, I was amazed at all of the unique and clever ways these are being used. 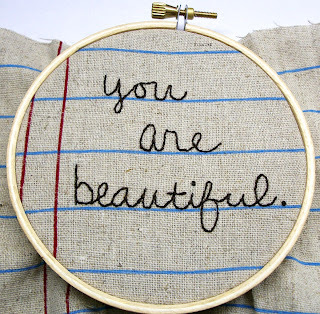 . . way, waaaay beyond stretching your fabric while embroidering. . . . There are SO many neat ideas (like these on Pinterest, or these 25 DIY projects from The New Home Ec,) that I'm only going to mention a couple of projects that I have used myself, or at least plan to do in the near future. 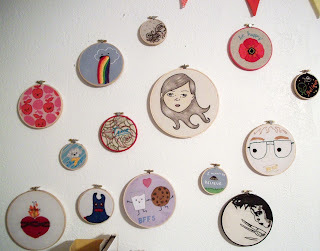 Here's our hoop art wall. . . .
Our hoops contain pieces we've made ourselves, or received in craft swaps. I love how it brightens our classroom! 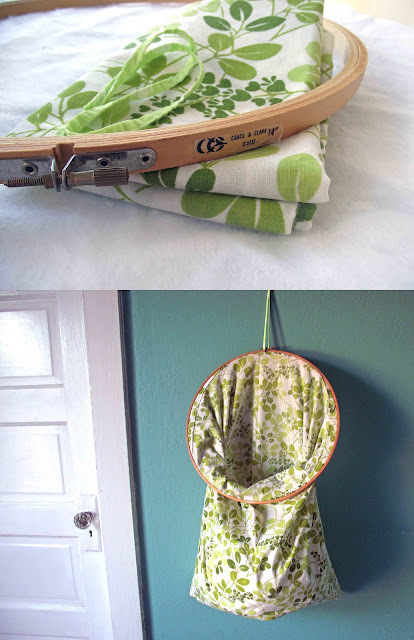 I've seen many examples of decorating with hoops of fabric, lace, vintage linens. . . easy and endless possibilities. image source and FREE pattern from Sew Daily. 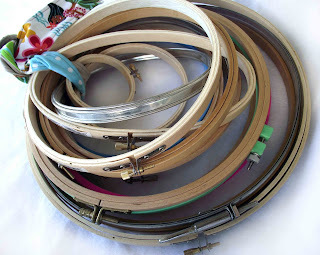 Pretty, useful, and great for using up little scraps of fabric.﻿ I use these in our classroom. Clothes hamper. Just... wow. 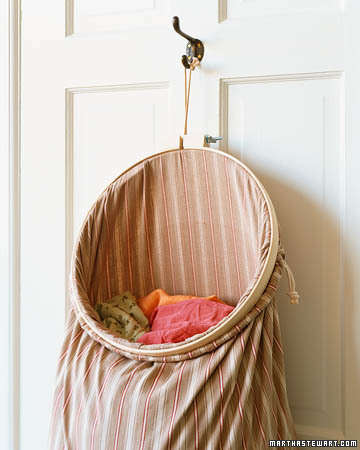 Three items and two minutes later, and you have a clothes hamper that stays open, hangs up, and is washable! is all I used to make this hanging stay-open hamper. First spied on Pinterest, and found at Martha Stewart, using a drawstring laundry bag and embroidery hoop . . . .
All of my kids now want one (and will get one) and I love how inexpensive, interchangable, and WASHABLE these are! 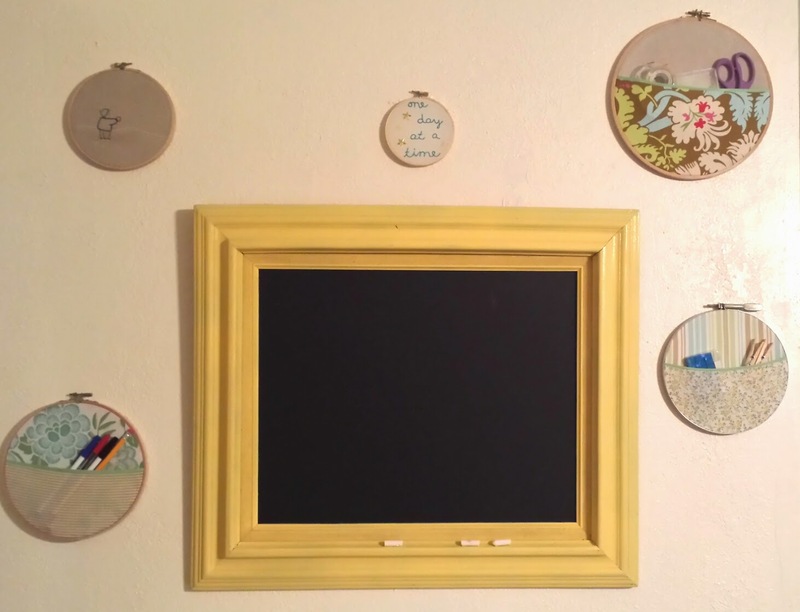 So I'm curious -- what is your favorite embroidery hoop project? 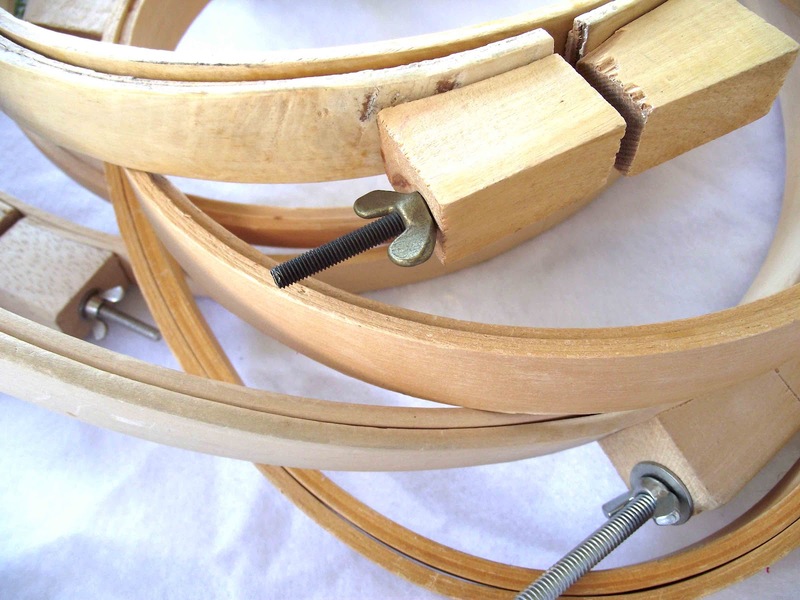 Is there a hoop project you plan to tackle soon? 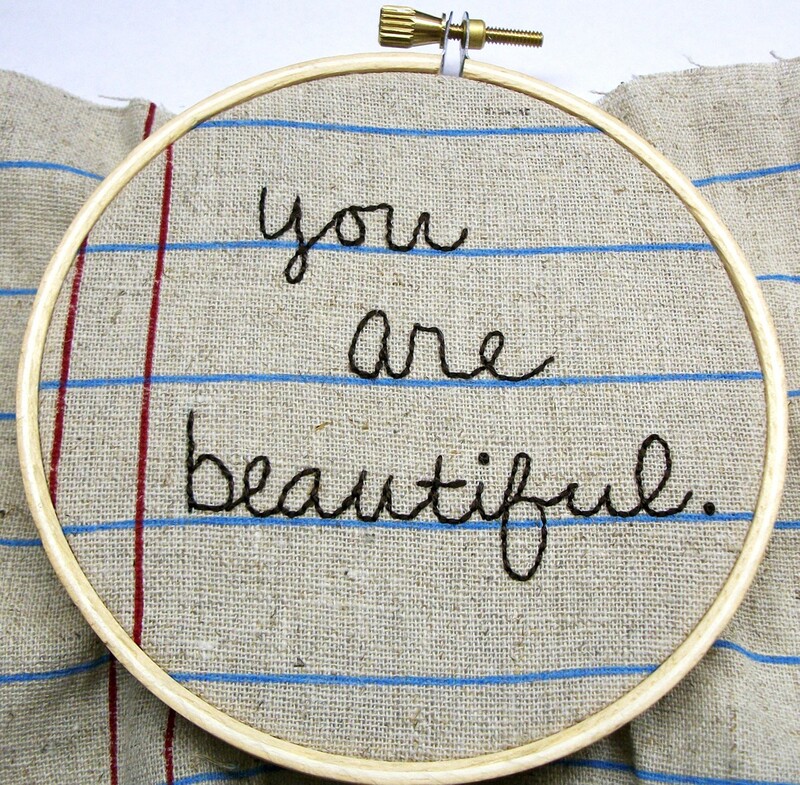 Please share your favorite hoop project links below if you'd like! See you soon. . . I can't wait to show you my fabric hoard stash progress! Haha! I love love love the cloud's sick. Very funny and cute. I spy my poppy embroidery :) I'm glad it's being enjoyed along with the others on your awesome hoopla wall! Came to this site while looking for ideas for onion & potato storage. A miniature version of your clothes hamper using a mesh lingerie bag would work perfectly. Thanx for the idea! WOW -- what a great idea, Jo1C! Thank YOU for sharing that! (sorry so late in replying... I don't know why I'm just now seeing this.) Thanks for dropping by! Love the hoop hamper! Unique! Did you sew the hoop hamper around it or just closed it up? Does it stay nicely? I just closed it up, and tightened the screw on the hoop. It's very snug, and stayed perfectly! 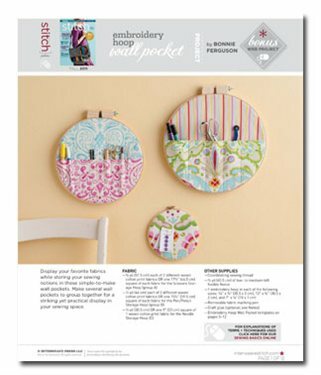 Reminded me of the old clothespin bags we used to use when hanging up laundry on the clothesline! Yes! They're very similar. Thanks for dropping by, Deborah!